Usually we don't celebrate Valentines Day as such, except for dining out. Or Sometimes I just make my dear delighted with chocolates or truffles which he enjoys the most instantly. After having kids we don't even get time to sneak out for V-day dinner, so I have started transforming dine-outs into romantic candle light dinners with soft music (Kenny G's)at home. In the same strings, this year also I have planned V-day meal to cook at home with (my dear's favorite) Italian varieties, Penne Pasta Primavera and Chocolate and Espresso Mousse ( yes, this was the special touch). As I have planned everything upfront (groceries done for the ingredients), I have started cooking busily after coming from work on Valentines Day. Already our wonderful Nanny kept insisting me to go out as she will take care of the kids. Then Vijay came home with his rumbling tummy (I didn't know he came with a different mission) and asked me to go out. So I had to stop what I was doing, Dressed up quickly and Ready to go. He suggested his all time favorite Comparis a Italain Place (he is a big fan of Italian), But he didn't know I have something new to try this time. 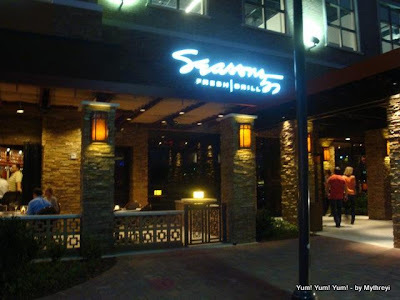 Since I read the review about this Seasons 52 restaurant (at Frisco Style Magazine), I had fallen in love with their concept and definitely wanted to try and waiting for the occasion to come. And here it is now. So I have suggested Seasons 52 which located at Shops At Legacy ( a nice strip of good eats with a walking stroll) which is closest to our home also. He agreed quickly (probably because of his rumbling tummy :-)). It was not hard to locate this new place at Shops At Legacy (right next to Pottery barn), to my surprise it is huge than i expected. Though the valet parking was a warm welcome, but I was thinking in mind 'Oh Boy! it is going to be a expensive dinner'. 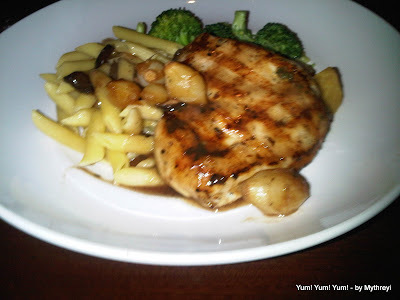 Seasons 52 , There is a significance to this name, the number 52 is the number of weeks in a year and this restaurant serves 52 different menus, that means one new menu every week. Ola! What a variety. That is first concept I loved. And they serve every entrée with farm fresh vegetables that are best in that season, the second concept I loved, and the best and last is every entrée is under 475 calories, Yes! even deserts. 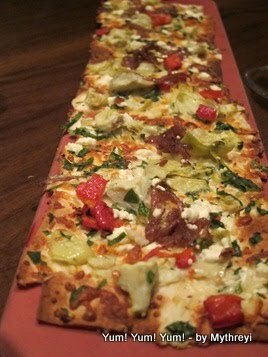 Grilled Artichoke Goat Cheese Flat Bread is delicious. The minute I stepped into the restuarant was expecting some wait time, to my surprise we were seated at the table in no time (i told this is big). It looked like warm, cozy and comfy space with decent mix of booths and individual tables and all the walls are well decorated with their rich wine selections. The ambiance was set with low light and every table is accompanied with candle light which makes it even romantic (not sure if it is always like this or this is V-day effect). While I am enjoying the space and ambiance silently, the server interrupted by asking us if this our first time, and when we said yes, he explained the concept of this restuanrant style (all the three concepts above), he also explained that they don't use any salty and sugary sauces and heavy creams and that's how they keep everything under 475 calorie count. And also he assured (as if he read my mind) that we don't have to worry about the taste and we don't have to leave hungry. Pan Glazed Tofu with Penne Pasta with Harvest Vegetables. When I quickly browsed the menu it is well designed which includes Appetizers, Salads, Main course with a good mix of pasta and rices and with a variations of different meats, seafoods and vegetable proteins ( tofu) and not limited to good choice of deserts. There is a separate weekly menu attached to it. We have ordered artichoke, goat cheese caramelized onions flat bread hesitantly (both of us never tried goat cheese). And browsing the menu for our picks for main course. The one and only veggie entrée on the main course list got my eye is Farmer’s Market Vegetable Plate, though the name sounded interesting, use of pears in the description was not so exciting for me. I was holding on to it and looking for a moment to ask for more suggestions. Vijay picked the only chicken entrée Fieldale Farms All-Natural Chicken Cabernet (the chicken is cooked with Cabernet Wine Sauce) which comes with wild rice and both of us are wondering how much he likes the wild rice :-). When the server came with our appetizer order ( that was quick) we could not take off our eyes from it. and he is ready to take the order for main dish, I have asked him for more vegetable entrées suggestions, he said there is different menu for vegetable entrées and he went to grab it quickly. I was in suprise and couldn't believe that (one more thing to love this place), they have a different menu for vegetable entrées (which is unusual). That menu also have decent list of items with up to 10 choices. 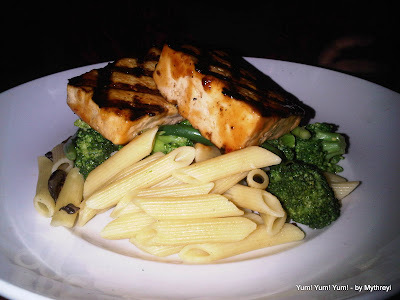 So I have picked Pan Glazed Tofu with Vegetables and Penne Pasta. And we substituted wild rice with pasta in Vijay's order (Yeah, he is not too delighted with the wild rice). Then we received our gorgeously looked flat bread with interesting display of vegetables and cheese. Both of us took the first bite and looked at each other with the same expression, 'OMG, heavenly, this is so delicious'. We have finished up the appetizer enjoying every bit of it. And then comes our main dish with almost no sauce pasta and crispy vegetables and fully flavored meat or (tofu). The quantity is decent and enough for single serving ( not huge like other Italian entrées) and served such way that it meets the food pyramid requirements. By the time we finished we are very full and stuffed with the good stuff. And then Vijay said no place for desert. But I have insisted him to try the mini indulgences ( that's what they call their deserts). 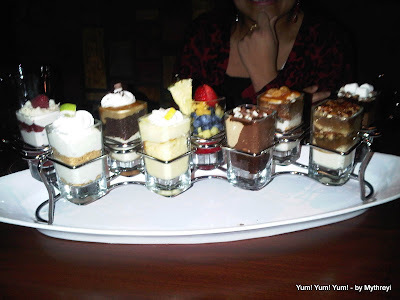 They are served in cute little 2 inch tall glasses (looks like shot glasses) looked very pretty and sounded interesting. I couldn't stop looking when the servers are carrying these cute little desserts and passed by our booth. The server also insisted us to just see those mini indulgences and then decide to order or not. (He is confident that those stunning looks of those mini deserts will make us order one for sure :-)). Wow, he brought, 10 to 12 varieties neatly decorated in showcase and explained everything briefly . That includes Pecan Pie, Rocky Road Mousse, Carrot Cake, Caramel Crumble, Cheese Cake, Fresh Fruit, German Chocoalte Cake and so many. The honey glazed pecans looked so inviting and we have ordered the Pecan Pie. It is the best and healthy portion to have the delicious desert. It is So Yummy! They have lot of wine selections too, vijay didn't aah-ooh about his wine here today. (as his disinterest towards wine these days, might be another reason). At the end we had a very rich and romantic experience with scrumptious dinner includes a full course meal along with a valet parking with no wait under 50 dollars. Will I go again to this healthy and delicious heaven? Yeah, With No Doubt. (to check their all week menu). Glad you like it Mythreyi and had a nice romantic dinner.